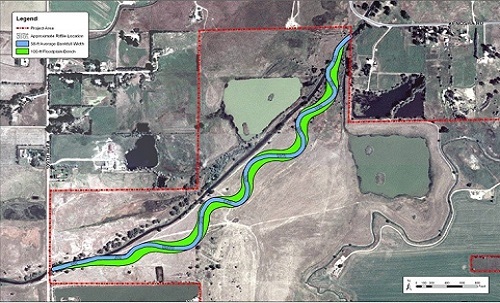 Lower Boulder Creek Restoration Hydraulic and Stability Analysis (CO) | WEST Consultants, Inc.
Lower Boulder Creek historically meandered through a wide floodplain that supported healthy riparian vegetation, many wetlands, and native fish and wildlife populations. Today, long reaches of the stream have been channelized, channel sinuosity has decreased, and stream diversions have reduced the size of channel habitat-forming events. A 430-acre parcel of land managed by the Boulder County Parks and Open Space Department (BCPOS) has been designated as a high-priority restoration site. WEST Consultants was asked to perform a hydraulic and stability analysis for three proposed stream restoration alignments. These alignments were developed by the U.S. Army Corps of Engineers, Omaha District in conjunction with BCPOS. Hydraulic models were developed using the HEC-RAS (River Analysis System) program based on the best available topography and flood project grading plans, and data from field reconnaissance. The HEC-RAS channel design and modification tool was used to create the preliminary design geometry templates for the three alignments. Each of the three alignments includes a floodplain bench—widths of 50, 100, and 150 feet were analyzed. Three methods were used to evaluate the stability of the existing channel and the three alignments, including hydraulic geometry relationships, analogy or “reference reach” method, and the shear stress method. The computed sediment transport capacity through the project reach was compared to the sediment transport capacity of the upstream and downstream reaches and to the sediment transport capacity of the existing channel. Various in-stream structures were evaluated for stream stability: large woody debris, cobble/gravel bars, gravel riffles/pools, boulder clusters, and Lunkers. Restoration design details such as pool/riffle morphology, overbank composition and stability, and typical plan and profile sections were developed. Potential project impacts for each alignment were analyzed, including impacts to floodplain limits and infrastructure and the potential for channel avulsion.